Another release, another report. Analysing machine data per production batch. Working closely with our customers to create value for their businesses is a key part of the innius philosophy. 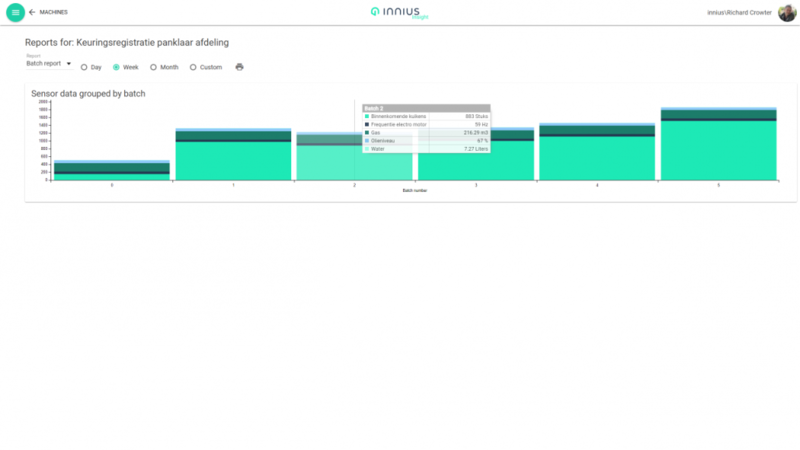 We had a really positive response to innius release 2.0 at the start of the year, both from existing customers and new prospects. The highlight of that release being the new Logistics Data report. It gave one of our customers the inspiration for a new kind of report, based on batch numbers. We also liked the idea and agreed to add it to our next release. As release 2.1 now goes live, we’re also pleased to announce the launch another new report, this time called the ‘Batch report’. Essentially what the Batch report does is relate machine production data to specific product batches. One of the powerful things about it, is that it enables analysis of different batches, even in real-time, as they move through the different steps of a production process. With batch sensors between the process steps, consecutive batches can be monitored even within the same production process. This is also covered in our Knowledge Base article. The report produces a graph where each batch is presented as a stacked bar. The steps within each bar represent the associated sensors values. This allows different batches to be compared alongside each other. Hovering over a bar, shows a pop-up dialog with the specific values. With the right sensors in place, conclusions can be drawn about the different batches in each step of the process; such as the length of process time, energy usage, weight, etc. Greater insight into the breakdown of the production process creates business value by allowing different product types to be have more accurate costings and for the production processes to be optimised. The Batch Report can be found in the reporting area of the Insight app, together with the other types of reports. Do note that this is different to the logistics data report, which was announced as part of release 2.0, because that specifies machine data based on the start and finish times of a production order from an external system.